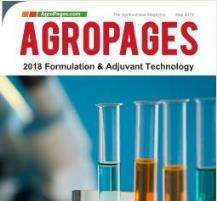 AgroPages is about to publish its business magazine《2018 Formulation & Adjuvant Technology》in May 2018. This issue is focused on the frontier technologies and development trends of formulation & adjuvant technology for crop protection, crop nutrition and biologicals. Moreover, we will also launch the featured directory of adjuvant & formulation-related companies and institutions to better showcase their products and services before the industry. In the last year's issue, more than 30 adjuvant and formulation companies like Akzonobel, Croda, Clariant, Dow Chemical, Lamberti, Lonza and emerging formulation companies Exosect, Vive Crop Protection have been listed in the directory. This year, we would like to invite more formulation/adjuvant-related companies and institution to join the company directory. 1. What kind of companies do you suggest to be covered in this formulation-related company directory? Could you please recommend the companies specialized in the research and development of formulation technology? Please brief their advanced technology. Could you please recommend the formulation companies for custom manufacturing? Please highlight their manufacturing advantage. Could you please recommend more dynamic adjuvant/additive companies? Please share their business profile. Could you please recommend more dynamic adjuvant/additive R&D Institutions? Please share their business profile. 6. Could you leave your contact information for further communication? Your name, company name and email etc.